It has been over a decade since Dr. Chris Leatt developed the first modern-day neck brace style that we have come to expect. As a medical professional who has dedicated his life to protecting the necks and spines of powersports enthusiasts, Dr. Leatt has been as exacting and ardently obsessed with the continual development, engineering, and construction of his products as the riders who wear them are to their machines. 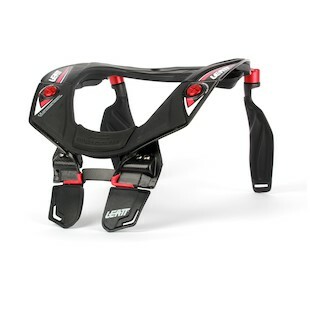 The newest innovation in this line is the Leatt STX RR Neck Brace. This marks the inaugural voyage into the world of braces that are designed specifically for road racing/track day motorcyclists. It has absolutely been no small task. As can be imagined, there are expansive differences between track riding and off-roading, and for years this has created fairly large hindrances to the entry of manufacturers into this market. 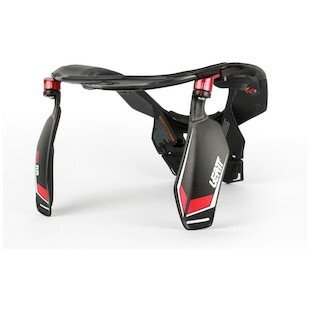 The genius of the Leatt STX RR is in the way that its ultra-light carbon design seamlessly incorporates itself around your race suit and comfortably remains in place without being obtrusive. By using the latest Alternative Load Path Technology™, the STX RR works to reduce the chances of severe neck injury by better transferring the forces of an accident away from the critical areas of the neck. In doing so, it helps to guard against dangerous injuries of hyperextension, hyperflexion, lateral hyperextension, and hypertranslation. Generally speaking, it is built to protect you from a lot of bad things that can happen if you and your bike become separated at a rate of speed that could potentially hurt you… which really doesn’t have to be that fast at all. In the end, it boils down to protection. We ride motorcycles because they are fun. We enjoy fun. However, it is also important for us to understand the inherent risks that come with our time on two wheels. This is something that Dr. Leatt and his team obsess over on a daily basis. If your motorcycle story includes time on the track, the STX RR Neck Brace is what the folks at Leatt have come up with to help keep you as safe as possible.